Home / Articles / Columnists / Earth Talk Q & A / Finding "Green Job"
With the environment now high atop the public agenda, green jobs are more popular than ever. Defined by eco.org (a leading green jobs website) as any job in any company where the primary focus is on reducing the impacts of our activities or products on the environment, green jobs serve to maximize efficient use of resources while minimizing degradation of the planet from pollution and waste. “Eco-jobs can range from engineering a photovoltaic solar cell to designing a building for more energy efficiency to landscaping a yard to minimize erosion to finding more sustainable forestry techniques,” reports eco.org. 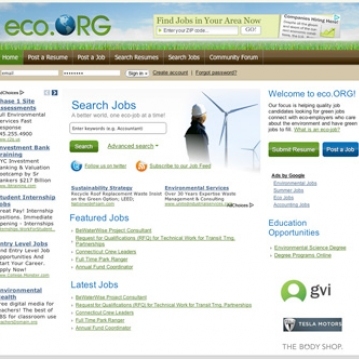 While you may be hard pressed to find environmental job opportunities on general employment search websites, sites like eco.org that specialize in green job listings can make your search easy. Also, many general environmental sites have employment sub-sections. Green job seekers and employers alike use these websites to find each other and get their work done, whether in the non-profit or for-profit worlds. Eco.org prides itself on hosting a wide range of listings from colleges, environmental and other nonprofit groups, media outlets and government agencies. With Google and Bing listing the site first for the search term “eco,” the website generates hundreds of thousands of page visits per month from thousands of green job seekers and employers, and also keeps its audience engaged through social networking. Another leader in the field is the nonprofit Green Jobs Network, which provides online services including a green job board and a 20,000 member group on the professional networking site LinkedIn. The group also uses its GreenJobs.net website as a platform for webinars, and is the home of the frequently updated Green Collar Blog, which provides career resources and information on the green jobs sector. Environmental Career Opportunities (ecojobs.com) is another tried and true source for green job listings. Some 50,000 targeted job seekers subscribe to the company’s biweekly newsletter that contains unique green job opportunities. Still other places to look for green jobs include Eco- Employ.com and the Environmental Career Center. Another site, Greenjobs.com, focuses on job opportunities specifically in the renewable energy sector. Jobseekers can use the website to apply for jobs, post their resume, obtain guidance on finding and applying for jobs, gain background information on the renewable energy sector, and access a directory of relevant companies and organizations. Employers can take advantage of the firm’s recruitment services. Browsing job listings at other more general environmental websites could also turn up that perfect opportunity. SustainableBusiness.com and the U.S. Green Building Council feature extensive green job listings as sub-sections of their websites. And yet another way to find a green job is to sniff around the website of a company, organization or institution in your field of interest for specific job listings—or better yet, call them on the phone to find out if there are any openings.